The aerial shots in Mysteries of Egypt capture the beauty of the Nile Valley. The majestic Nile River flows north from the headwaters in Burundi to the Mediterranean Sea, a distance of 6,650 kilometres. This makes it the longest river in the world! The shape of the Nile River Valley resembles a lotus flower, the ancient Egyptian symbol for the regeneration of life. The long, narrow river valley is the stem, the delta that spreads out in the shape of a triangle is the flower, and Fayyum Region is a bud. For centuries, the Nile River flooded the valley, enriching the land with a thick layer of alluvial soil. Flooding occurred from July to September as the result of the tropical rains in the Ethiopian tableland. The river attained its highest level in October, then began to recede to its lowest point sometime between April and June. Some degree of flood control has been practised since early times. River banks were raised and canals dug to funnel the water over the land. Elaborate precautions were taken to prevent overflooding, but, at times, excessive flooding caused destruction and a loss of property and life. The land has not experienced flooding since the construction of the Aswan Dam, however. The dam was built in 1902 and raised to its current height sixty years later. 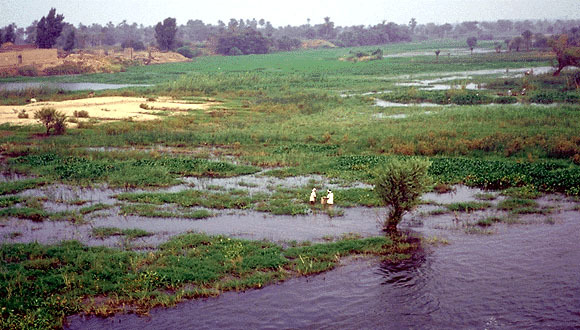 The flooding of the Nile rendered the narrow strip of land on either side of the river extremely fertile. Intensive agriculture was practised by the majority of the peasant population. As the flood waters receded, sowing and ploughing began, using primitive wooden ploughs. 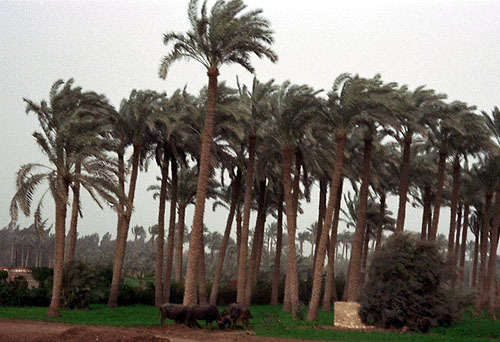 Since rainfall is almost non-existent in Egypt, the floods provided the only source of moisture needed to sustain crops. Irrigation canals were used to control the water, particularly during dry spells. 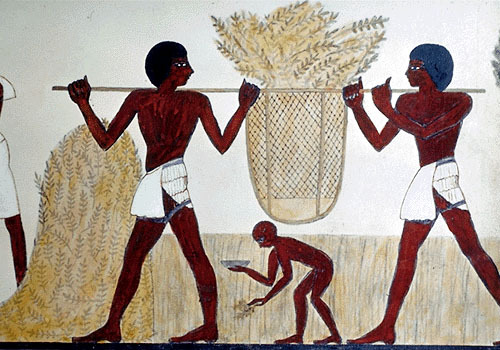 The principal crops cultivated during the Pharaonic era were barley, emmer (a coarse wheat), lentils, beans, cucumbers, leeks, onions, dates, figs and grapes. The abundance of flowers provided nectar for the bees to produce honey, which the Egyptians processed. 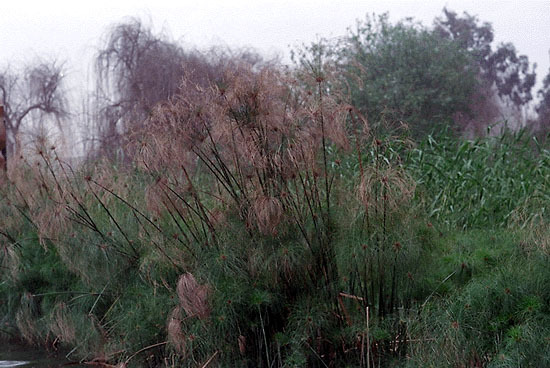 Flax was grown for making linen, and papyrus was harvested to be converted into paper, ropes, mats, sandals and light skiffs. A variety of domesticated animals were raised, including cattle, oxen, sheep, goats, pigs, ducks and geese. Donkeys and horses came from Asia around 1600 B.C., and camels were introduced much later. During the time of the early pharaohs, camels were unknown. The Nile River was the highway that joined the country together. Up until the nineteenth century, travel by land was virtually unknown. Since there are no forests in Egypt, wood was brought from Lebanon. 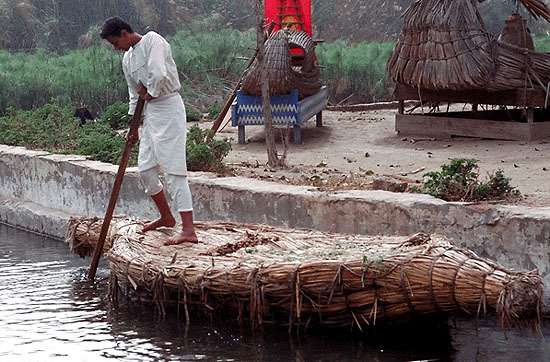 Acacia wood was used in Lower Nubia to build the boats that transported granite for the construction of pyramids. 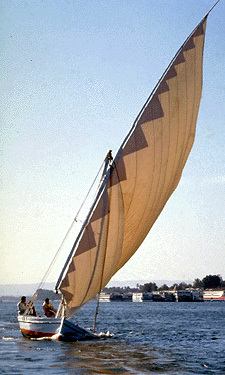 Today, the felucca, a small open sailboat, is a common mode of transporting people and goods on the Nile. The Nile River Valley is truly a gift to Egypt. Without its water and rich soil, the Egyptian civilization would not have emerged.